Manchester Mozzies claim AFLCNE 2014 title. The Manchester Mosquitoes strengthened any claims that they are the powerhouse of the AFLCNE competition when they dispatched a worthy foe in the Huddersfield Rams in the 2014 Grand Final. Clubs often don’t want to blow their own trumpets too loudly for fear of setting themselves up as the hunted, but the statistics for Manchester are impressive. The last five years has now netted four grand final appearances for three premierships: a consistency that would be the envy of all other opponents. After finishing the home and away season on top of the ladder, undefeated but sharing a controversial tie with the Wolverhampton Wolverines in Round Three, the Mozzies ran out comfortable winners in their semi-final against the Birmingham Bears. The Huddersfield Rams finishedthird after the home and away season and had to get past the highly improved Nottingham Scorpions to reach the grand-final, which they did. Come the big day and Huddersfield won the first and second quarters, setting up a possible upset. But the Manchester team found their mojo in the second half to eventually run out comfortable 39 point winners. 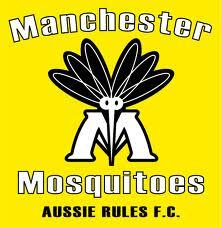 “Manchester Mosquitoes defeated Huddersfield Rams 15.17.107 vs 9.14.68, 26/07/2014 at Sheffield Tigers RUFC. Sam Boyd (Manchester) was deservedly voted Best On Ground by umpires Peter Cleveland and Ian Fabio Kafka. Congratulations to Alex Salama on taking the league golden boot, and since it’s no longer a secret, the Mozzies’ Golden Boot too! 52 goals in the home and away season alone. Ryan Bower of Sheffield took overall league Best and Fairest for the year, with Birmingham’s Sam Willatt taking the Best Brit award.